I fully admit to knowing next to nothing about the Atlanta band Lyonnais – except that they rock. The four piece began in 2008 as a project between two WRAL-Atlanta music directors, Farbod Kokabi and Farzad Moghaddam, and the two clearly have an affinity for drone, psychedelic and post-rock, as they layer on the heavy reverb and distortion without apology. Their music has become increasingly experimental, focusing on longer compositions that defy the traditional 3-to-6 minute format. This show at Glasslands, opening for Eternal Summers (that recording here), gave Lyonnais a chance to thrive in what might be a more natural environment for a band of their style – Williamsburg. These five songs – mostly longer-form compositions – showcased their ability to combine dense, reverb-heavy guitar jams with surprisingly accessible hooks. Although all of the material was new to me, I hope it will become more familiar as the band progresses to the album release stage in the (hopefully) near future (their debt album is being shopped to labels at present). I recorded this set from the same location as the Eternal Summers recording, and the sound is excellent. Enjoy! Please help out with the setlist – as the band does not appear to have any releases, the only source of song info I could find was their MySpace page. 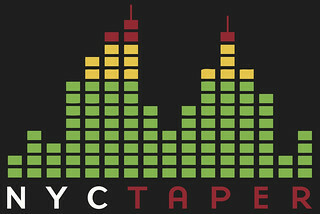 If you download this recording from NYCTaper, we expect that you will PLEASE SUPPORT Lyonnais, visit their MySpace page, and find out more about the band (including their forthcoming album release date) from Tell All Your Friends.